I started on Craftster in this section years ago, and haven't posted here in forever. My friend IRL TuffasSnails just had a baby and isn't posting, and I see that Vegbee is living in an RV [so happy for you! I miss mine] and am now wondering if anyone I know still posts here in the kid section?! It's funny, today Amelia saw me looking at Craftster, asked what it was, and asked me to put her "on the Craftster", the tiny baby I made diapers and baby carriers for who was completely oblivious of being online! sorry for the overkill, but she picked 'em! there you go kiddo, you're "on the Craftster"! I read that to her an she said "give me the paci! I need the paci" definitely naptime! she definitely meant "thank you" and "my mom took too long editing pictures"!, I swear! What a cute dress. And Amelia : you look beautiful. she said "thank you" this time! Both the dress and your daughter are very cute. 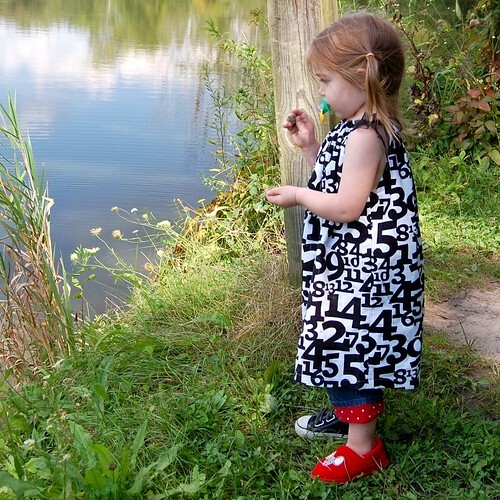 I just love the fabric - great for a toddler learning her numbers. she is ADORABLE and i love her style! great dress, mommy! glad to see you're still around. i haven't touched my sewing machine in ages - poor kiddo #2 has had only two things made for her EVER, and they were very simple, so you're a sewing goddess IMHO. looking forward to seeing more. I looked through my bookmarks for something else and went "yea! a name I know!" i haven't touched the machine for anything since making these, I think there are 4, then again Amelia messed with my serger, and NO amount of fixing it with the book and rethreading and setting tension has gotten it working again! I will flim flam the day lights out of you! I dont know if I will ever get a chance to sew again though.... yikes. I love the dress! She is so fantastic!